and I am presently Leaving alone.Our Lord Jesus Christ is my comforter. to be used for the work of God all over the world. I await your urgent reply and remaim blessed in Jesus Name. God bless you and how are you today? Your letter has come to the right place. My name is Father William Wallace of the Church of Fish and Bread, and we have nearly 300 churches in our ministry. Please find attached one of our newest small churches which we recently built in Nairobi, Kenya. I think I may be able to help you. I am afraid that my ministry forbids me from entering into the business proposition that you mention, but I am able to offer you help by other means. Your cause is a Godly one and it is the policy of my church that we help our fellow man forward the word of God and help the less fortunate people. You see, my church regularly makes charitable donations to worthy causes, and I am sure that after speaking with my committee members, they will be of the opinion that your cause seems very worthy and if you will allow us we would like to make a donation to your cause if you will agree to help us forward the word of God. If you are willing to use the donation for the good of God and to help your less fortunate fellow citizens then I am sure we can quickly arrange a donation to be made to you. Hopefully this will help you to have a more pleasant life. Your case seems very worthwhile, and whilst we cannot donate large amounts - because we have already made many successful donations this year - I think that the church would be able to donate to you the small sum of US $352,330 (three hundred and fifty two thousand, three hundred and thirty dollars). We are usually able to donate larger amounts but at the moment are funds are quite limited as we are at the end of our financial year. This money would be sent to you in a manner of your choosing, and hopefully it would enable you to make yourself and your family safe as well as forward the word of God much more easily. 1. 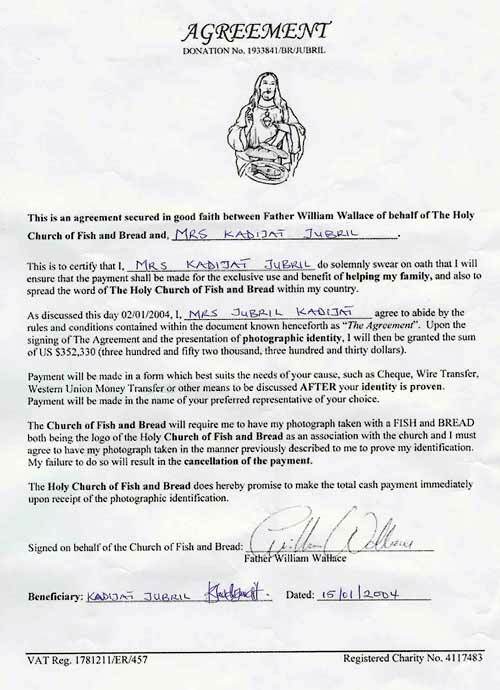 The Church of Fish and Bread will send you a agreement form, which you will have to complete and sign. 2. On receipt of the form, we will require a photograph of you, or a trusted representative as proof of identity. You will have to get a NEW photograph taken, holding two symbol of ours. 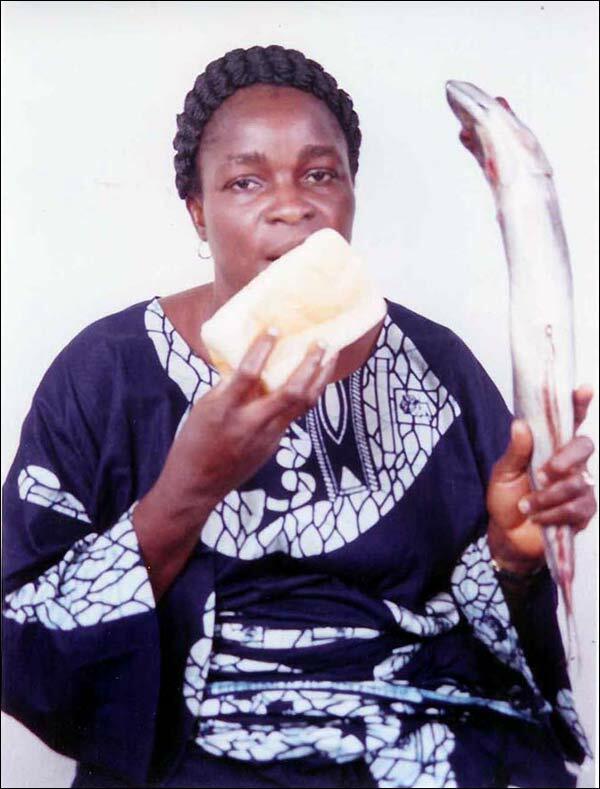 The two symbols we need you to hold are a loaf of BREAD and a FISH (the name of our church). This proves that the person in the photograph is genuine. Passport or other photographs will NOT be accepted. If you agree to the two conditions above, we will attach the agreement form for you to complete, and then after that we will explain to you what type of photograph we need from you. Please do not send a photograph until we have explained how we want the photograph to be taken. On receipt of a SATISFACTORY photograph, we will immediately forward the $352,330.00 to you in a manner of your choice. Please let me know ASAP if you are interested in my offer Mrs. Jubril and I will forward you the agreement for your signature ASAP. glad to meet up with your requirement. Blessings to you my sister and I hope that this email finds you in good health. Please find attached the Donation Agreement from. Mrs Jubril, I need to make you completely understand what will be required of you before the committee are able to grant you this donation. Should you be in full agreement then I am sure that we can proceed in a very brisk manner and arrange to have your donation before the end of this year. First it is VERY IMPORTANT that you understand we must be 100% certain of your identity. Because our church is so very large and we give out nearly $10 million Dollars a year in charitable donations there are some people who try to send us false images in order to falsely claim a donation. Because of this my church always request identity in a manner which cannot be forged. I warn you now Mrs. Jubril that the photographic proof we will request from you may seem very strange to you, but it is this very unusual request that will ensure that the image you send to use is genuine. I am sure that you will agree that to pose for a unusual picture will be no trouble considering the sum of 352,330.00 we are willing to donate to you. Here is the donation procedure in detail. Please read through it carefully, and if you agree to the terms of the church then I am sure we can proceed very quickly to help you. 1. Attached is the Donation Agreement form. Please take note of the Agreement Number and quote it on all future correspondence. This way we know that all communications from you are genuine. Please complete the blank areas of the form and send it back to us as an attachment. 2. Next you will have to send the church a photograph of yourself in the pose we describe below. Here is how we need the photograph to be posed. I will go through it step by step so that you fully understand. 2. You will need to sit in a chair. 3. You will need to place the FISH on your HEAD. 4. 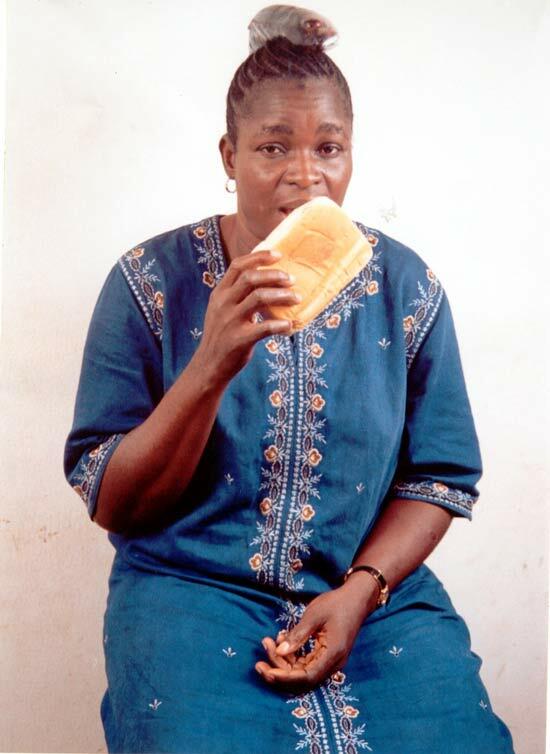 Hold the loaf of BREAD to your mouth and make it look like you are going to eat it. 5. Now get a colleague to take a photograph of yourself in this pose. VERY IMPORTANT: Please ensure that the photograph is BIG and CLEAR. Small or unclear photographs will NOT be accepted. One you have scanned in the LARGE and CLEAR photograph, please send it back to me as an attachment. One both the photograph and the agreement form have been received and approved your donation payment will be paid out IMMEDIATELY in a manner of your choosing. Please note that I urge you to follow the above instructions VERY carefully. If for any reason the photograph is not taken in the manner that we require we will demand another photograph. Mrs Jubril, of course I fully understand that the picture request seems very strange, but as I have explained before, it is this very strangeness that will ensure to the Donation Committee that the image is not a forgery. Once you have successfully completed the two requests above, the donation will be paid out to you IMMEDIATELY in the manner of your choosing. There is one other thing, but this may of course be of no interest to you and it is not important that you do so but, for every extra person you can include in the image with the SAME POSE, we are willing to donate an extra $9.500.00 each. It is valuable to use to recruit more followers and representatives. Please note that once suitable photographs have been received and verified they will all be destroyed as a matter of security and confidentiality. I wish you many blessings and I look forward to hearing from you again soon. 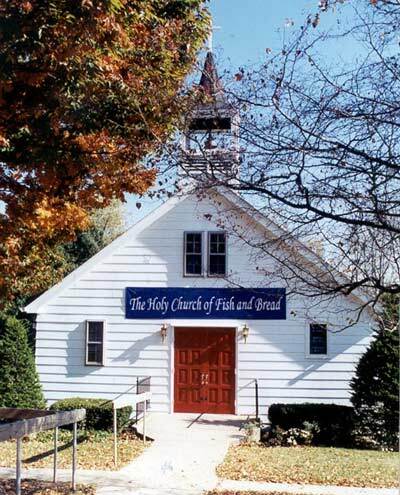 The Holy Church of Fish and Bread. unstable but thank God am feeling much more brttrt now. made out to me and how long is this going to take?. As for your questions; our church headquarters is located in London, England, but as I have already explained, we have many other churches, over the UK and indeed other countries. I am afraid that I have nothing to do with the church web site. This is controlled by a different section of our ministry. All I can tell you is that we have been waiting for a company to upgrade our new site, and the old one has been under construction for about two weeks now. With regards to your donation. The only thing that is requires is the picture and the signed Agreement Form. Once a satisfactory picture is received and the form completed the money will be paid out immediately. anything you think we can do? Am hoping to read from you soon. Please let me know what form you can accept the agreement form in and I will ask the donation committee to send it in the manner of your choosing? I urge you to act quickly in this matter as the church cannot send out donations AFTER the 18th of January 2004. Subject: Re: Having little problem. Please find attached the image in the form of .BMP as you requested. The committee will need to see the signed agreement form and photograph before the 18th of this month. If you are unable to send it by that date then there will be a delay in processing your donation award. Please remember that it is VERY IMPORTANT that the image you send is LARGE and CLEAR. Subject: form and picture attached. the donation committee's time and am hoping to read from you soon. I thank you for sending the picture and form. The FISH is not in the position required. You must reposition the fish into the requested position and make sure that your hands are not touching it. I would like to congratulate you on the quality of the picture though. I am happy that you have sent a large clear image as requested. I have therefore urged the Donation Committee to delay the donation closure date until the 23rd of January to enable you to send in a new image and they have agree to do this for you. Congratulations again, you are halfway toward receiving your payment. with this details before i can go further on this issue. I am very happy to supply you with the addresses of our churches. Do you want all 300 or just our two main headquarters? If you feel uncomfortable with proceeding, that is fine. Please let me know as soon as possible and I can have the donation cancelled immediately. child to return to school at present. Good morning, and I hope you are well. My name is Father Murky, and I regret to inform you that Father Wallace is currently unwell and is spending some days in hospital. Unfortunately he contracted a stomach bug and we are trying to find out what it is that is causing his pain. The doctors have informed us that he may be ill for some time. However, all the details of your case have been passed over to me and I will be handling everything to do with your donation from now onwards. Please be patient as I have to read any clarify myself with all the documents relating to you case. I shall try to get back to you later today or tomorrow morning. getting better and i pray God would be well soon in jesus name. committe should have done that please let me know what is going on?. Please be aware that until this morning I did not know anything about the donation payment. At the church we have a very stringent testing system and procedures. These must be followed correctly and cannot be rushed through. I have to read through all of Father Wallace's email communications and also double-checked all the paperwork, which I must then present to the Donation Committee for final approval. Once the Donation Committee have given their approval then you are correct, the payment to you can be made immediately. To save some time, please would you inform me how you would like this donation to be paid? Sir hope you would be able to conclude on this very soonest. just mailing you to know what is going on. father williams health now hope is getting better. I must apologise for my late reply but I have some sad news to announce. I am sorry to say that Father William Wallace passed away in his sleep on Friday evening. It appears the stomach bug the doctors though he had turned out to be a fatal virus. Thankfully he felt no pain and passed away in his sleep. With regards to your donation payment, you have stated that you want the payment via Western Union. Please can you give me the full name and address of the person to whom the payment is to be made out to. Once the funeral of Father Wallace has been completed (it is to be held tomorrow morning) then I will attempt to make the payment to you. and ps try as much as possible to send me the photographs. second term of the present government in power. staying too long over there in the security company. I am very disturbed by some developments today. Now, I wish to know now exactly how this person got my email address, and WHY he posted the above email from the SAME computer as yours. I know for a fact that the email above was sent from the same computer. I know full well that Mr. Kingsley's email is a "419" email, so I know he is a dishonest person. It disturbs me that your messages and Mr. Kingsley's messages are being sent from exactly the same machine. I require a full explanation before proceeding. believe this explain my position clearly. Please an you contact me on this email address as soon as possible? My name is Father Frasier Crane and I am a member of the Donation Committee for the Holy Church of Fish & Bread. It has some to my attention that for some reason your donation has still not been processed and I am trying to find out exactly why this is. Unfortunately, Father Murky who I believe was processing your donation has been sent to Coventry on a mission to oversee the building of a new church, and I see by reading his paperwork that this payment has still not been made to you. We are unable to contact Father Murky as he is deep in the jungles of Coventry and this prevents communications by telephone because of the very thick forestation. We shall only be able to speak with Father Murky when he returns in 6 weeks time. This leaves me without any reasons why your payment has not yet been made, so I am appealing to you to tell me if you know of any reason why you have not yet received your payment. Please get back to me as soon as possible as I would like to get this matter cleared up and the payment processed. Well, many weeks later and there is still no reply from Kadijat, so I can only assume one of her two brain cells kicked in and she realised she was being baited. Ah well.... NEXT!